As I was walking Toby the dog yesterday I pondered on the fast passage of 2017 as we crunched the red, brown, orange, and yellow leaves beneath our feet. How can one be so happy with the natural display of colors and yet so startled by the pace of changing seasons? And so it is that I am now planning for Thanksgiving. I was looking forward to seeing my grandsons but it is likely they will not be visiting. My plans now revolve around a delicious dinner for the four of us and a craft project for my break. That is where Kathy Schmitz's new book comes in. 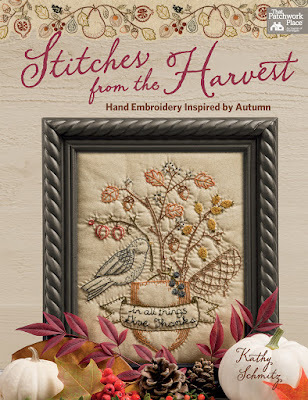 Have you seen Stitches From the Harvest by Martingale? 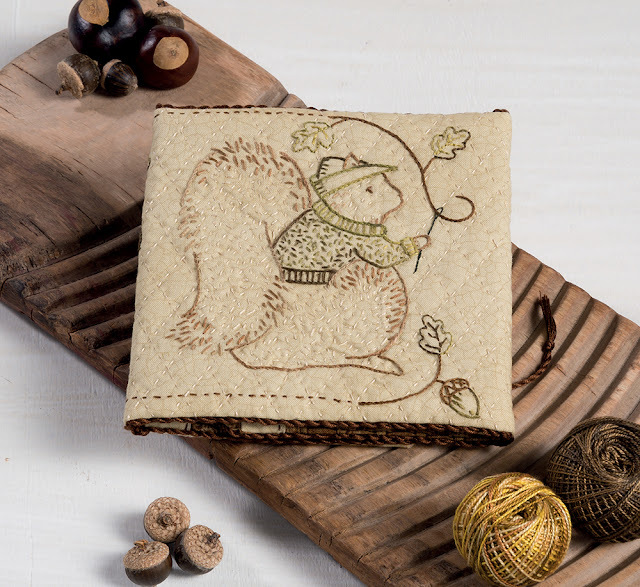 It is a beautiful collection of stitchery inspired by Autumn - its colors, its textures, our memories. Using cream backgrounds in various shapes, Kathy translates her childhood memories of this time of year into easy to stitch vignettes: the gorgeous but simple stitches are described and well illustrated at the end of the book - all the help we need to reproduce her designs and imprint onto fabric our own favorite symbols of Autumn. I love how Kathy uses stitches to add depth to her designs much as she does when painting and drawing. 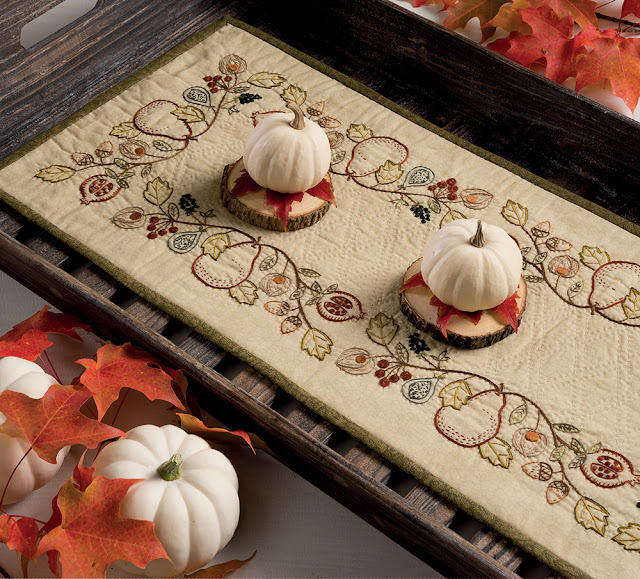 On the table runner above, the cream canvas gains texture with small quilting stitches. For those of us who prefer machine quilting our projects, this effect can also be achieved by machine quilting with the walking foot, except I would use larger stitches. Her palette brings inside all the warm colors from outdoors, something we will appreciate when the ground is white, the houses are surrounded by brown, black, and grey sticks, and the sky can't decide between grey or white. If you have a lot of company joining you for Thanksgiving, a downtime will be in order. 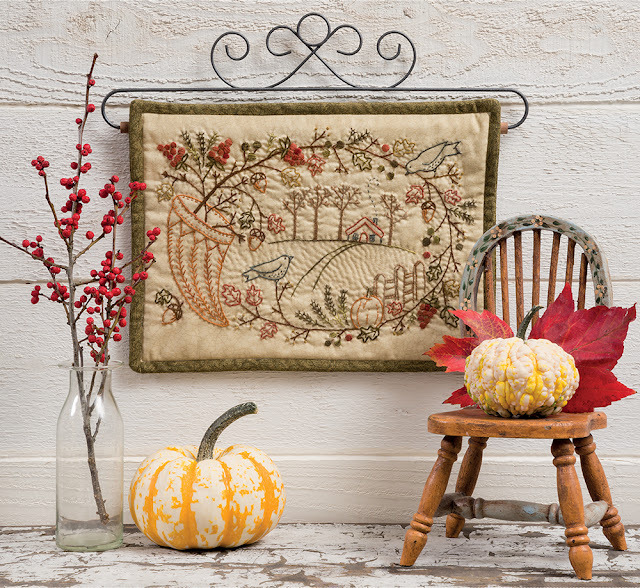 It will be a great opportunity to embroider heirloom pieces or small gifts for your friends. Stitches from the Harvest has 15 projects to help you relax and create - a delicious and calorie-free recipe for makers regardless of our crafty inclinations. By the time I came back home with Toby I was already looking forward to the holiday. 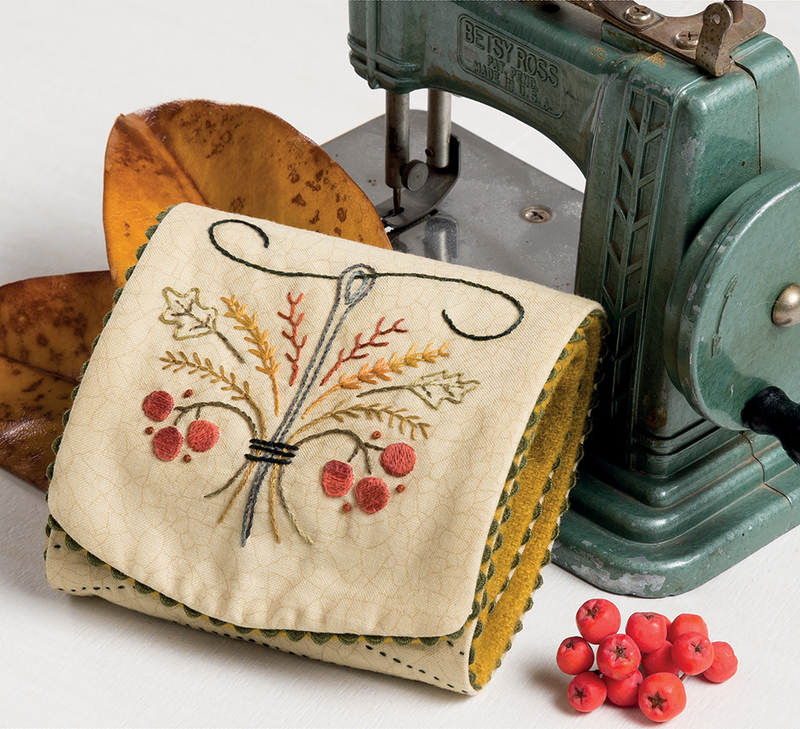 Don't you love having something to look forward to, particularly when it involves needle and thread? These are all so beautiful and the stitching on them is incredibly! Thank you so much! We must be kindred spirits when it comes to the changing seasons!